Designed for both heavy cover and open water, the Terminator Walking Frog features lifelike detail from nose to skirt. 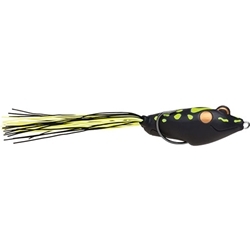 Tail-weighted to increase casting distance and stability on the retrieve, it features a custom VMC frog-gap hook. An ability to shed water between casts eliminates a water-logged frog that is hobbled by added weight and unbalanced action. This throws off its cadence and causes big bass to take a pass.